We recommend to begin acquaintance with the city on the Neva River with a sightseeing tour, during which you will see the famous historical and architectural monuments of St. Petersburg, ride in a comfortable bus along its main streets, avenues and embankments and learn a lot of useful information about one of the most beautiful cities in the world. Journey through the center of St. Petersburg will begin at the Alexander Nevsky Lavra. The ensemble of laurels, founded in 1710, is one of the earliest in the city. It consists of monastery buildings and several cemeteries, where many prominent figures of Russia are buried. The compositional center of the monastery is the Holy Trinity Cathedral, built according to the project of the architect I. Ye. Starov. 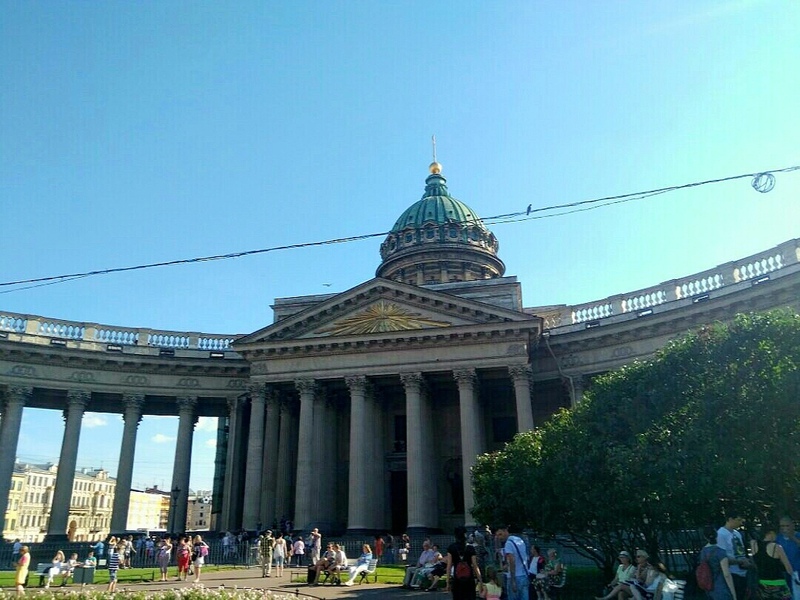 Crowned by a large dome, the cathedral is one of the dominants of St. Petersburg. Leaving behind the Alexander Nevsky Lavra, you will pass along Staro-Nevsky Prospekt, which is the continuation of the main thoroughfare of the city - Nevsky Prospekt. Now it seems incredible, but once on the site of Nevsky Prospect there was a clearing cut through in the forest more often. 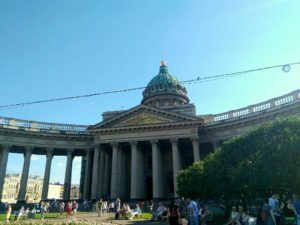 Gradually it turned into one of the main roads of St. Petersburg, connecting the Admiralty with the Alexander Nevsky Lavra. It is curious to know that the word Prospect comes from the word "perspective" and is used to denote a straight street. However, Nevsky Prospect can not be called direct. Two of its parts are at an angle to each other, forming a break in the area of ​​the Uprising Square. The fact is that two groups of woodcutters, cut through the clearing for the prospect on two sides, made a mistake in the calculations and found their mistake only when they met approximately in the middle of the glade, that is, where the area of ​​the Uprising is now. This area used to be called Znamenskaya, and on it was the Znamenskaya church. Now the metro station "Ploshchad Vosstaniya" is built on the site of the church, and in the middle of the square there is an obelisk erected in honor of the 40th anniversary of the victory over fascist Germany. 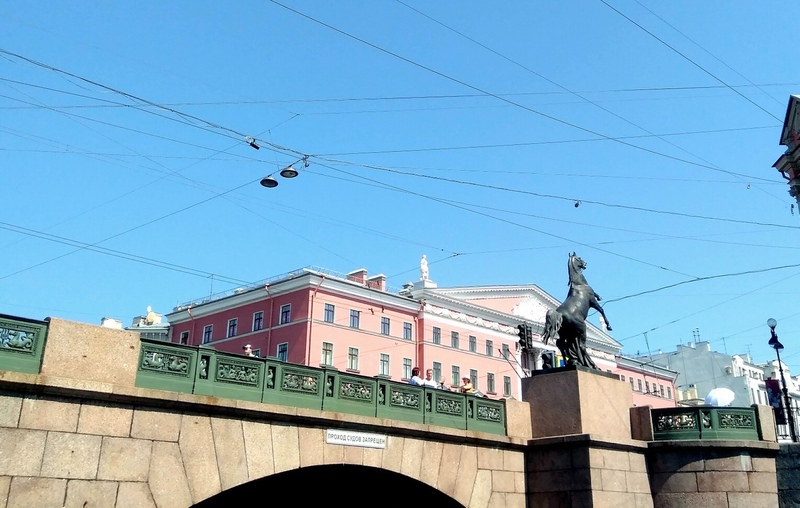 Your acquaintance with St. Petersburg will continue with a trip along Nevsky Prospekt. 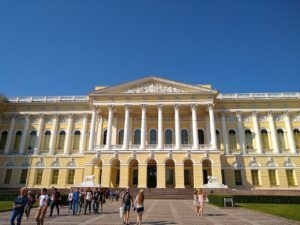 You will see the famous building of the Alexandrinsky Theater, which is one of the best examples of Russian classicism. The symbol of the theater is a sculptural composition on the attic of the building, depicting the chariot of the patron of the arts of Apollo. 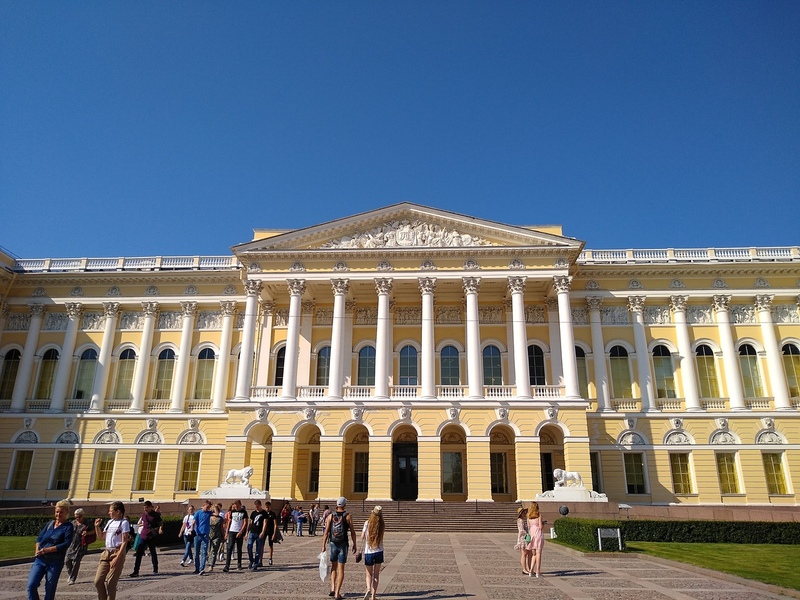 The Alexandrinsky Theater is known as the "Theater of Masters": its artistic troupe is famous for its professionalism and talent far beyond St. Petersburg. During the tour you will visit the Iskustv Square, named so because all the buildings facing it with a facade are somehow connected with art. On the square are theaters, museums, as well as the Mikhailovsky Palace, which houses the Russian Museum. A monument to the poet Pushkin, installed in the center of the square, harmoniously completes its ensemble. At the Church of the Resurrection of Christ, or Savior on the Blood, you will learn about the tragic pages of the history of Russia. The temple was built on the very spot where on March 1, 1881, terrorists killed Emperor Alexander II. The cathedral is made in the style of Russian temple architecture of the 17th century. You will see the Kazan Cathedral - an outstanding example of Russian architecture of the early 19th century. It was built on the site of a small church, in which the miraculous icon of the Kazan Mother of God was kept, and named in honor of this icon. Monument to the heroes-Field Marshals Mikhail Kutuzov and Barclay de Tolly is set in front of the facade of the temple. The Admiralty is an architectural and compositional center of St. Petersburg, in which Nevsky Prospekt, Voznesensky Prospekt and Gorokhovaya Street converge. The gilt spire of the Admiralty is one of the symbols of St. Petersburg. The Dvortsovaya Square is one of the most beautiful architectural ensembles not only in St. Petersburg, but all over the world. It bears the name of the Zimniy Palace, located on the square, which until the October Revolution was the official royal residence. The Zimniy Palace was built in 1754-1762 according to the project of Baroque architect Bartolomeo Rastrelli. Today, part of the Hermitage collection is located in the halls of the Zimniy Palace. In the center of the Dvortsovoy Square stands the Alexandrian column - one of the tallest monolithic columns in the world. Its length is 47 meters, weight - 600 tons. The column is famous for not being strengthened on the foundation, but is kept solely by precise calculation and own weight. On the Dvortsovy Bridge you will reach Vasilievsky Island, the largest island of St. Petersburg. On the Strelka Island are established the famous Rostral columns, symbolizing the maritime glory of Russia and St. Petersburg. They are decorated with metal rostra - nasal parts of the ships, which gave the name to the columns themselves. St. Petersburg State University, founded by the decree of Peter I in 1724, is a major scientific and cultural center. About 20,000 students study at the University. This is the oldest in the city educational institution is rightfully considered one of the best in Russia. From the Vasilievsky Island a beautiful view of St. Isaac's Cathedral opens. As you approach your cathedral, a cathedral with a high bell tower is one of the main signs of the city. The memorable silhouette of the Peter and Paul Fortress organically entered the Neva panorama of St. Petersburg. During the excursion you will admire the Letniy Garden with its marble statues, and you will also see the legendary cruiser "Aurora", whose salvo signaled the beginning of the storming of the Zimniy Palace on October 25 (November 7 according to the new style) of 1917. At the end of the tour you will see a view of the Smolny ensemble, dominated by the Smolny Cathedral. The temple, executed in the style of the late Baroque, was built according to the project of the architect B.-F. Rastrelli. The cathedral is distinguished by an unusual decoration of the facades, blue walls and white stone sculpture which give the temple a special expressiveness. We hope that acquaintance with St. Petersburg will remain in your memory for a long time, and you will return here again to visit the places you especially like.